The difficulties related to treatment of this fracture are both biologic and technical. Biologic problems are a result of the healing process and may occur with appropriate treatment and anatomic reduction. These problems include lateral spur formation with pseudo cubitus varus and true cubitus varus. Technical difficulties are the result of errors in management and may result in nonunion, malunion, valgus angulation, avascular necrosis (AVN), or a combination of these conditions. The physis of the lateral condyle extends into the trochlear notch of the distal humerus (see the image below). Therefore, in some lateral humeral condyle fractures, the lateral crista of the trochlea may be part of the fracture fragment, leading to an unstable humeral ulnar articulation. Diagram of intact distal humerus. The distal humerus is primarily cartilage at the age when these injuries typically occur, and knowledge of the secondary centers of ossification is necessary to understand the possible fracture patterns. Because of incomplete ossification, the fracture may appear subtle on radiographs as it courses through the cartilage anlage (see Workup). The lateral condyle fracture is a Salter-Harris IV fracture pattern and follows physeal injury principles. (For more information about injuries of the growth plate, see Salter-Harris Fractures.) The fracture fragments in these patients are primarily cartilaginous as a result of the young age of the patients. The radiographic interpretation may be misleading because the visible fragment appears smaller than the actual size and, in addition, the amount of displacement is not appreciated. 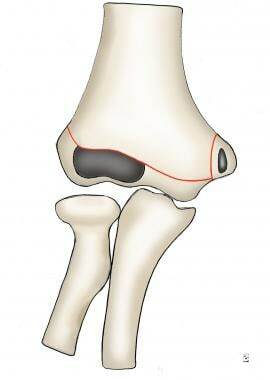 Lateral condyle fractures account for 17% of all distal humerus fractures and 54% of distal humeral physeal fractures. The frequency of lateral condyle fractures peaks in children aged 6 years. Most fractures occur in children aged 5-10 years. Cases have been reported in patients as young as 2 years and as old as 14 years. In a study of 181 pediatric lateral condyle fractures treated with open reduction and internal fixation (ORIF; mean follow-up, 38 weeks; mean age, 5 years), Silva et al compared patients treated within 7 days after injury (group 1; n = 133) with those treated 7-14 days after injury (group 2; n = 48) to identify any significant differences in outcome. They reported no iatrogenic nerve injuries or vascular complications in either group, and mean operating time was similar. At final follow-up, groups 1 and 2 were similar with respect to range of motion (ROM), complication rate (low in both), and percentage of satisfactory outcomes. Silva et al also studied 191 pediatric lateral condyle fractures treated either with ORIF (group 1; n = 163) or closed reduction with percutaneous pinning (CRPP; group 2; n = 28) and followed for over 12 weeks. They found CRPP to be a viable alternative for treating these fractures in cases involving limited initial displacement (2-4 mm); cosmetic results were better, operating times were shorter, and the complication rate was not significantly increased. Stimson LA. A Treatise on Fractures. Philadelphia: Henry C Lea; 1883. MILCH H. Treatment of humeral cubitus valgus. Clin Orthop. 1955. 6:120-5. [Medline]. MILCH H. Fractures of the external humeral condyle. J Am Med Assoc. 1956 Feb 25. 160 (8):641-6. [Medline]. MILCH H. FRACTURES AND FRACTURE DISLOCATIONS OF THE HUMERAL CONDYLES. J Trauma. 1964 Sep. 4:592-607. [Medline]. Weiss JM, Graves S, Yang S, Mendelsohn E, Kay RM, Skaggs DL. A new classification system predictive of complications in surgically treated pediatric humeral lateral condyle fractures. J Pediatr Orthop. 2009 Sep. 29 (6):602-5. [Medline]. Lemme K, Lubicky JP, Zeni A, Riley E. Pediatric lateral condyle humeral fractures with and without associated elbow dislocations: a retrospective study. Am J Orthop (Belle Mead NJ). 2009 Sep. 38 (9):453-6. [Medline]. Sullivan JA. Fractures of the lateral condyle of the humerus. J Am Acad Orthop Surg. 2006 Jan. 14 (1):58-62. [Medline]. Silva M, Paredes A, Sadlik G. Outcomes of ORIF >7 Days After Injury in Displaced Pediatric Lateral Condyle Fractures. J Pediatr Orthop. 2017 Jun. 37 (4):234-238. [Medline]. Silva M, Cooper SD. Closed Reduction and Percutaneous Pinning of Displaced Pediatric Lateral Condyle Fractures of the Humerus: A Cohort Study. J Pediatr Orthop. 2015 Oct-Nov. 35 (7):661-5. [Medline]. Pennock AT, Salgueiro L, Upasani VV, Bastrom TP, Newton PO, Yaszay B. Closed Reduction and Percutaneous Pinning Versus Open Reduction and Internal Fixation for Type II Lateral Condyle Humerus Fractures in Children Displaced >2 mm. J Pediatr Orthop. 2016 Dec. 36 (8):780-786. [Medline]. Pennington RG, Corner JA, Brownlow HC. Milch's classification of paediatric lateral condylar mass fractures: analysis of inter- and intraobserver reliability and comparison with operative findings. Injury. 2009 Mar. 40 (3):249-52. [Medline]. Jakob R, Fowles JV, Rang M, Kassab MT. Observations concerning fractures of the lateral humeral condyle in children. J Bone Joint Surg Br. 1975 Nov. 57 (4):430-6. [Medline]. Gaston MS, Irwin GJ, Huntley JS. Lateral condyle fracture of a child's humerus: the radiographic features may be subtle. Scott Med J. 2012 Aug. 57 (3):182. [Medline]. Knutsen A, Avoian T, Borkowski SL, Ebramzadeh E, Zionts LE, Sangiorgio SN. Accuracy of radiographs in assessment of displacement in lateral humeral condyle fractures. J Child Orthop. 2014 Feb. 8 (1):83-9. [Medline]. [Full Text]. McGonagle L, Elamin S, Wright DM. Buried or unburied K-wires for lateral condyle elbow fractures. Ann R Coll Surg Engl. 2012 Oct. 94 (7):513-6. [Medline]. Das De S, Bae DS, Waters PM. Displaced humeral lateral condyle fractures in children: should we bury the pins?. J Pediatr Orthop. 2012 Sep. 32 (6):573-8. [Medline]. Wirmer J, Kruppa C, Fitze G. Operative treatment of lateral humeral condyle fractures in children. Eur J Pediatr Surg. 2012 Aug. 22 (4):289-94. [Medline]. Ganeshalingam R, Donnan A, Evans O, Hoq M, Camp M, Donnan L. Lateral condylar fractures of the humerus in children. Bone Joint J. 2018 Mar 1. 100-B (3):387-395. [Medline]. Conaway WK, Hennrikus WL, Ravanbakhsh S, Winthrop Z, Mahajan J. Surgical treatment of displaced pediatric lateral condyle fractures of the humerus by the posterior approach. J Pediatr Orthop B. 2018 Mar. 27 (2):128-133. [Medline]. Fink Barnes LA, Parsons BO, Hausman M. Arthroscopic Management of Elbow Fractures. Hand Clin. 2015 Nov. 31 (4):651-61. [Medline]. Hausman MR, Qureshi S, Goldstein R, Langford J, Klug RA, Radomisli TE, et al. Arthroscopically-assisted treatment of pediatric lateral humeral condyle fractures. J Pediatr Orthop. 2007 Oct-Nov. 27 (7):739-42. [Medline]. Perez Carro L, Golano P, Vega J. Arthroscopic-assisted reduction and percutaneous external fixation of lateral condyle fractures of the humerus. Arthroscopy. 2007 Oct. 23 (10):1131.e1-4. [Medline]. Park SH, Kim SJ, Park BC, Suh KJ, Lee JY, Park CW, et al. Three-dimensional osseous micro-architecture of the distal humerus: implications for internal fixation of osteoporotic fracture. J Shoulder Elbow Surg. 2010 Mar. 19 (2):244-50. [Medline]. Pankaj A, Dua A, Malhotra R, Bhan S. Dome osteotomy for posttraumatic cubitus varus: a surgical technique to avoid lateral condylar prominence. J Pediatr Orthop. 2006 Jan-Feb. 26 (1):61-6. [Medline]. Tien YC, Chen JC, Fu YC, Chih TT, Huang PJ, Wang GJ. Supracondylar dome osteotomy for cubitus valgus deformity associated with a lateral condylar nonunion in children. Surgical technique. J Bone Joint Surg Am. 2006 Sep. 88 Suppl 1 Pt 2:191-201. [Medline]. Badelon O, Bensahel H, Mazda K, Vie P. Lateral humeral condylar fractures in children: a report of 47 cases. J Pediatr Orthop. 1988 Jan-Feb. 8 (1):31-4. [Medline]. Rutherford A. Fractures of the lateral humeral condyle in children. J Bone Joint Surg Am. 1985 Jul. 67 (6):851-6. [Medline]. van Vugt AB, Severijnen RV, Festen C. Fractures of the lateral humeral condyle in children: late results. Arch Orthop Trauma Surg. 1988. 107 (4):206-9. [Medline]. Lateral condyle fracture. Note subtle fracture line. Lateral condyle fracture, additional view. Fracture may be subtle and can sometimes be missed. MRI demonstrating Milch type I fracture pattern. MRI demonstrating Milch type II fracture pattern. Intraoperative fluoroscopic radiograph of Kirschner-wire fixation of lateral condyle fracture. Milch type I fracture pattern. Milch type II fracture pattern.